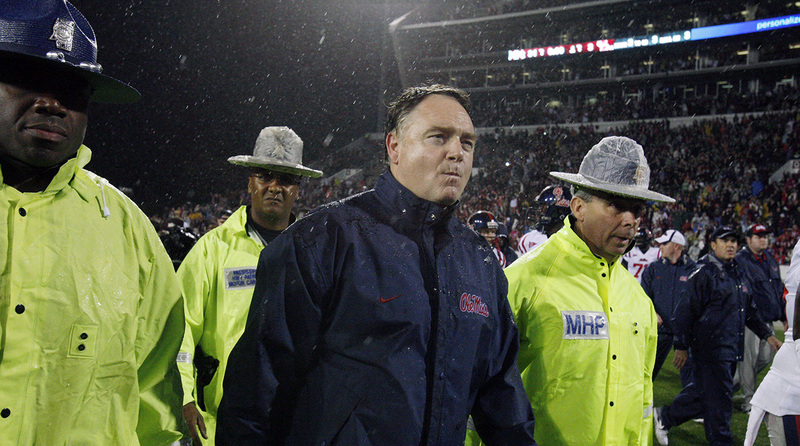 Former Ole Miss head coach Houston Nutt has filed a lawsuit against his former employer. SI's legal analyst breaks down the details. Did Ole Miss betray its severance agreement with former head football coach Houston Nutt as part of a “smear campaign”? Has the university unlawfully scapegoated Nutt for its extensive troubles with the NCAA? Or is Nutt simply unwilling to take personal responsibility for numerous recruiting problems that occurred under his watch? These questions, among others, are now headed for federal court. There is no telling the kind of evidence and testimony that might surface along the way. On Wednesday, the 59-year-old Nutt, who coached Ole Miss from 2008 until his firing in 2011, filed a breach of contract and breach of good faith lawsuit against the University of Mississippi and the Ole Miss Athletic Foundation in the U.S. District Court for the Northern District of Mississippi. Nutt insists that Ole Miss repeatedly and knowingly breached Section 8 over a period of four years. To advance this argument, Nutt charges that once Ole Miss football became the target of an NCAA recruiting investigation, Nutt’s successor, Hugh Freeze, and other Ole Miss athletic officials hatched a scheme to misdirect prominent journalists into believing that Nutt was mainly to blame for alleged recruiting violations. The NCAA’s probe into Ole Miss football has cast a cloud over the program for some time. The NCAA began to investigate Ole Miss athletics in 2012. Within a year, the probe started to look closely into the Rebels’ football program. In 2016, the NCAA’s enforcement staff delivered its notice of allegations (NOA) to Ole Miss. Although Nutt’s lawsuit highlights that Nutt’s name doesn’t appear in the NOA, four of the 13 allegations levied against the football team concerned claims of misconduct that took place during Nutt’s tenure. For instance, the NCAA asserted that in 2010, members of Nutt’s staff arranged for recruits to receive fraudulently high ACT scores. Indeed, according to the NCAA, a testing supervisor completed exam answer sheets of top recruits, thereby making them academically eligible to play. Most of the NCAA’s allegations, however, concerned alleged misconduct that took place under the tenure of Freeze. Calling it a “deceitful strategy,” Nutt contends that Freeze, Ole Miss athletic director Ross Bjork and athletic department officials conducted various “off the record” conversations with journalists in which the journalists were led to believe that Nutt was largely responsible for alleged misconduct. In this news story, Journalist #1 wrote that one source “with knowledge of the probe” said “the current football staff of head coach Hugh Freeze is not believed to be implicated in any major violations, and that much of the football inquiry dates back to actions by a previous Ole Miss staff.” It is now clear that Journalist #1’s unnamed sources gave him false and misleading information. The sources who lied to Journalist #1 before he wrote this story did so for the purpose of creating a false public narrative that would deflect the heat created by the NCAA investigation from Coach Freeze to Coach Nutt. Off the record conversations are crucial for journalists in reporting on controversial stories. In such conversations, journalists agree to not publish the name or other identifying characteristics of the source in exchange for the source sharing confidential information with the journalist. Numerous articles about the NCAA’s probe into Ole Miss football contain information and speculation that had been shared off the record. Nutt also insists that Ole Miss made public statements that were “false and misleading.” For instance, on Jan. 30, 2016, athletic director Bjork posted a statement that stressed “many of the allegations [date] back to the former football staff in 2010.” The statement implied that Nutt was mainly to blame. Additionally, Nutt contends that Ole Miss—a public university and thus subject to public records requests—wrongly rejected records requests from journalists for access to an amended NCAA NOA which, like the first NOA, did not mention Nutt’s name (though, like the first NOA, mentioned allegations that took place under Nutt’s watch). These denials, Nutt suggests, were part of a surreptitious strategy on the part of Ole Miss officials to delude and confuse journalists. If Nutt prevails in his claims against Ole Miss, he demands unspecified monetary damages for lost wages, emotional distress, embarrassment and attorney’s fees. Nutt further demands that he ought to be awarded punitive damages, which are seldom awarded and would require a finding of especially egregious misconduct on the part of Ole Miss. Nutt maintains that alleged badmouthing by Ole Miss officials has caused him professional harm. “The job opportunities are much more limited,” Nutt’s complaint stresses, “for a Division 1 head football coach who leaves under the cloud of an off-the field scandal or, worse yet, rumors and allegations that the coach and his staff were cheaters.” It should be noted Ole Miss fired Nutt, who is now a college football analyst for CBS, during a particularly abysmal year for the football program. In 2011, the Rebels finished 2-10 and 0-8 in the Southeastern Conference (SEC). Nutt also seems hopeful that his lawsuit will motivate the SEC to impose a punishment on Ole Miss or at least publicly reprimand the school. Specifically, Nutt charges that Freeze recruited players while conveying through “false statements or false pretenses” in contravention of SEC Bylaw 10.2. Ole Miss is armed with several possible legal strategies. For starters, Ole Miss could contend that none of Nutt’s arguments establish that Ole Miss broke the law. Much of Nutt’s complaint charges that Ole Miss mislead journalists into believing that the bulk of blame for the NCAA’s investigation rests in the hands of Nutt. Ole Miss would likely reply by arguing that the university has consistently stated that the alleged recruiting violations took place over the course of two coaching administrators, that of Nutt and then that of Freeze. In other words, it isn’t as if Ole Miss has claimed that everything wrong took place under Nutt. A court might regard Nutt’s contentions as more of an editorial critique of Ole Miss and Freeze than a legal one. Further, Ole Miss could assert that its communications in response to the NCAA investigation were privileged and thus fell outside the scope of its severance agreement with Nutt. This defense is particularly relevant in regards to any communications between Ole Miss officials and NCAA officials that addressed Nutt. Typically, statements in a legal proceeding cannot constitute grounds for defamation. Along those lines, Ole Miss could insist that its responses to NCAA inquiries fell outside the scope of its contractual agreement with Nutt. After all, if that were not the case, Ole Miss might not have been able to credibly defend itself against serious allegations. Ole Miss is also aware that Nutt would be hard-pressed to prove the details and circumstances of any off-the-record conversations between Ole Miss officials and journalists. Those journalists would never voluntarily agree to testify—a credible journalist never gives up their confidential sources. Likewise, those journalists would likely refuse to comply with a subpoena that would require them to testify. Those reporters could invoke the so-called “reporter’s privilege,” which though not expressly recognized under federal law is often acknowledged by federal judges as consistent with both the First Amendment and the need for reporters to gather news using confidential sources. Federal courts under the appellate authority of the U.S. Court of Appeals for the Fifth Circuit, which governs federal courts in Mississippi, recognize a reporter’s privilege in civil lawsuits involving confidential sources. This legal dynamic advantages Ole Miss. Ole Miss, however, may be slightly disadvantaged by the fact that Nutt filed his complaint in federal court, rather than state court. Had the case been filed in state court, it would have been adjudicated in a Lafayette County court. Potential jurors for such a case would have been drawn from a region with many Ole Miss alumni and where judges are elected. Wisely, Nutt instead filed in federal court, where potential jurors would be selected from a wider area across the northern federal district of Mississippi and where judges enjoy lifetime tenure. In some ways, the main danger Nutt’s lawsuit poses to Ole Miss is not that Ole Miss might one day be ordered to pay Nutt some amount of money for breaching his contract. It’s that Nutt’s lawsuit could lead to a pretrial discovery process that would require various Ole Miss officials, including Hugh Freeze, to testify under oath about sensitive topics and to share potentially damaging electronic messages with a court. Such information could become public, which might not only embarrass Ole Miss officials but also grab the attention of the NCAA. It is expected the NCAA will at some point punish Ole Miss. The timeline for that punishment is unclear, particularly with the accompanying Rebel Rags litigation (as Pete Thamel and I recently wrote about), but later this year or in 2018 seems likely. If Nutt’s lawsuit reveals new and damaging information about Ole Miss recruiting and if that information becomes part of a public record, the NCAA could rely on it for purposes of assessing potential punishments. With that risk in mind, Ole Miss might be poised to try to reach an out of court settlement with Nutt. Such a settlement would end the litigation before it posed a risk of danger to Ole Miss. That said, as reported by Pat Forde, Nutt demanded an apology from Ole Miss in May. He never got one. For now, at least, Ole Miss seems poised to fight it out in court.